Competition is fiercer than ever. More than 50-percent of businesses don’t make it past the initial three years according to the British Enterprise Research Centre, and if you are planning on thriving, you need every competitive advantage you can get. Many entrepreneurs have turned to expensive viral marketing and cloud platforms and neglect the authentic and aesthetic aspects of their business. That’s where we come in. Shades Awnings is an authentic local manufacturer with more than ten years of experience designing bespoke crème de la crème awnings, canopies, and pergolas with the finest materials and eye-catching styles. Our goal is to make you happy and give you a product that exudes craftsmanship and elegance, helping your business appear unique and special. How would our pergolas help you stand out? From our Pergola Wood that will give your cafe an authentic, classical look, to our Pergola Opera that’s just perfect if you are going for a chic style for your restaurant, we offer a multitude of highly customisable commercial pergolas that will not only protect your store from the sun, keep your customers cool, and shield everyone from the wind, but also provide a level of quality that will help you stand out as a high-end restaurant or cafe, ensuring that your customers remember you while they are enjoying themselves in the cool summer shade. We’re not just a manufacturing company – we have a highly skilled and experienced design team. We only need a photo of your building and a description of what you want, then we’ll help you decide on the type and style of your pergolas. We create detailed mock-ups of the pergolas in relation to your building; we’ll show you what the end result will be before you even decide if you want to proceed, which will help you save time and money. You can be sure you’ll get exactly what you want thanks to our design team. Our commercial pergolas are made out of a quality aluminum frame strengthened by stainless steel, which makes it is pleasing to look at on the outside while being highly durable and strong on the inside. Rain or shine, you’ll find our commercial pergolas useful. We use waterproof and highly stable PVC covers that block sunlight, rain, and are highly wind-resistant, meaning your customers are completely protected from the elements and have a nice atmosphere where they can enjoy themselves. Our Pergola Wood uses Nordic Pines, which have been famous for their durability since the classical era, so they are sturdy and give a naturalistic atmosphere. This shows how much we care about quality, from the frames to the PVC covers, so contact us now, and we’ll be happy to bring it right to your doorstep. Will they fit my store? Our Pergola Level is practical and contains only the nuts and bolts. If you want an inexpensive solution that will provide an extended area to do your business operations, this is the best choice. You’ll get a high-quality commercial pergola that provides protection from the sun, the rain, and the wind without the extras. 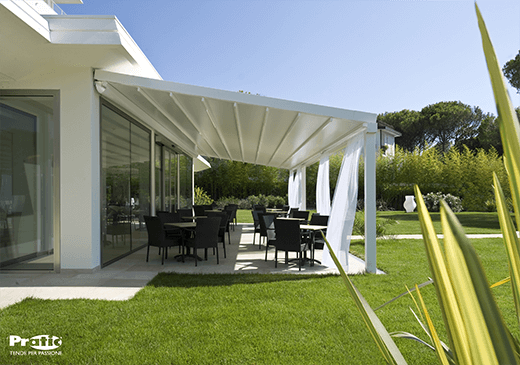 The Pergola Opera is a modern luxury solution that can be self-supporting or wall-mounted, and it has adjustable sunscreen blades that can rotate up to 140°. So, not only is it chic, but it’s also way more flexible. If you mount it to your restaurant, you can ensure the place gets as much as it needs to keep the place warm and comfortable, thanks to the adjustable blades. Pergola Wood, as the name suggests, is made out of wood. The wooden frame gives it a pleasant natural aura. It’s perfect for retro places and cafes that want to appear more in-sync with nature and appear more welcoming to the customer. Pergola Big is our answer to those who need the greatest flexibility. 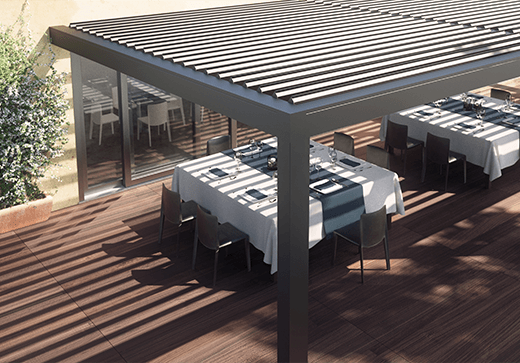 The maximum dimensions of this commercial pergola are thirteen by seven meters. It is designed specfically to cast the biggest shade and protect the widest area. If you’ve been looking to adorn and protect the outdoors of your business, this is the best solution.